White noise - that’s all one can assume that is going on. That’s all one can assume that is going on. Suddenly trade fears have evaporated or are evaporating slowly, and markets are reacting accordingly by putting risk back on the books. Technology stocks led the way today. Of note, the new member to the Dow, Walgreens Boots slumped as a result of Amazon acquiring an online pharmacy. The other reason for the rise could be the announcement from the White House that Trump was meeting with Putin, paving the way for embargoes to be removed and opening up Russia to U.S. business interests. This should be strange for the GOP but money talks. Despite the advance in equities, bonds were slightly weaker but in reality, held steady. Bonds are still reacting to trade fears and that mindset is unlikely to change anytime soon. Chinese shares continued their slump to fresh two-year lows and bonds are somewhat concerned that a slowing Chinese economy won’t be good for global growth. The Shanghai Index was down 0.9% and is now down 10% for the month. The concern over global growth is seeing the yield curve in the U.S. continue to flatten. Chinese CDS rose to 73 bp the highest since June 2017. The tide may be slowly turning for Italy. Italy sold 6.5 bio euros of bonds today. The bid to cover was near the highs and this is a good sign. The Italian 10-year rallied 3 bp on the day. Meanwhile, the bonds of other EU countries rallied. The bunds and OATS edged lower in yield. The big fear for the Euro could be migration, as many populist parties are receiving support for anti-immigration policies. Meanwhile, the BOE appears to be stalling on further rate hikes in the future. Andy Haldane, the Bank’s Chief Economist, commented that he did not anticipate a faster pace of interest rate rises that the central bank had pencilled in its forecasts. Economic data on the U.S. suggests the economy slowed in the first quarter with the weakest consumer spending in nearly 5 years. GDP increased by 2% in the January -March quarter. This is a fall of .2% from the previous estimate in May according to the Commerce Department. On other news, Deutsche Bank failed its stress test again whilst Goldman Sachs and Morgan Stanley can’t raise dividends or engage in buybacks beyond earlier levels. JP Morgan has been told to scale back its doling out of more cash to shareholders. 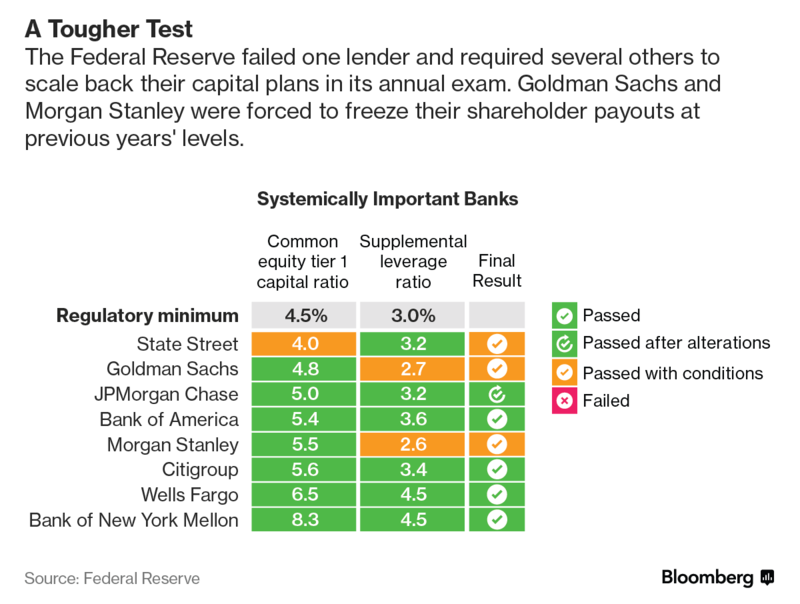 Six banks in all were forced to scale back their capital return plans. 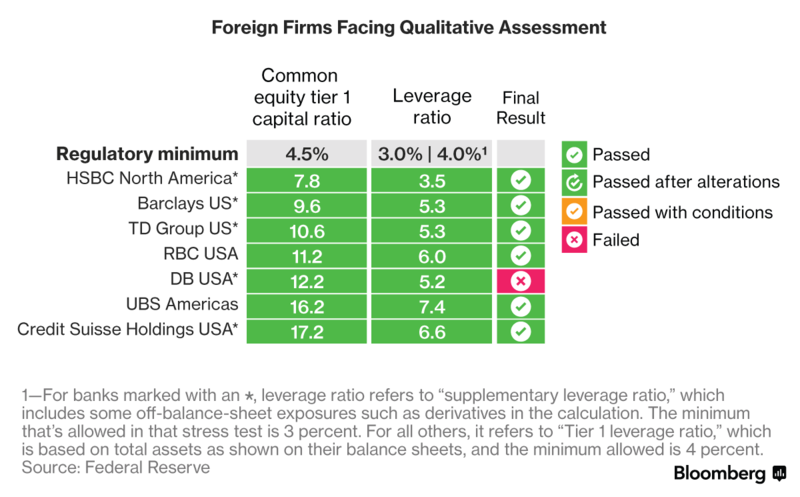 Thirty-five firms underwent the stress test with the regulator clearing 34 with the exception of the German lender Deutsche Bank who failed because of material weaknesses in its data and controls. The results limit the amount of profits the NYC branch can send home to Germany. Alibaba, after much fanfare earlier, appears to have significantly reduced its ambitions in the U.S.
Trump appears to be looking for a successor to his Chief of Staff John Kelly. He could leave as early as this weekend. Equities: The S&P rose 0.6% The Dow rose 0.41%. The Stoxx 600 fell 0.8% and is at the lowest level for some 11 weeks. Currencies: The Bloomberg Dollar Index fell 0.3% while the euro rose 0.1%. Bonds: The ten-year closed around at 2.84%. The 2-year closed at 2.516% and the 30-year closed at 2.967%. The ten-year bund closed at 0.316% and the UK gilt closed at 1.26% and the OAT closed at 0.64%. The U.S. curve closed the day with the following closes 2/10 at 32bp, 2/30 at 45 bp and the 10/30 closed at 12.8 bp. The U.S. 5-year closed at 2.717%. The U.S. yield curve flattened on the day. Commodities: WTI rose 0.8% while gold fell 0.5% and copper fell 0.6%. Bitcoin is trading around $6,117. Equities should see a small rally and bonds will probably see a selloff as we head into the weekend. No major movements are expected. However, comments could move the direction. In addition, geopolitical risks remain high.